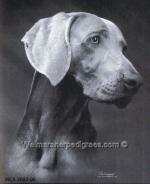 AlamoGhost’s Duke von Morgen is a silver weim from ANZ bloodlines. Duke’s sire Ghostwind Hits The Mark is an imported stud that has earned two titles with IABCA. Our boy Duke is registered with the American Kennel Club and has sired several strong litters. Duke is a well toned dog with striking features including block head, long legs and a proud gait. Proven stud, multiple AKC registered litters.